O conteúdo desta página não está disponível em Português no momento. Tenuta Cammarana, a five-room farmhouse in southeastern Sicily, is so uncompromisingly of its place that, if the family running it weren’t such skilled hosts, the effect would almost be spoiled by the presence of foreign guests. Much of the home looks like a geological outgrowth of the land itself, with centuries-old walls comprised of large white stones (from the farm’s own fields, surely) and pressed earth, floors made of limestone from the surrounding hills. The residence was built in 1778 by the same workers who constructed the Sortino Trono Palace, a World Heritage site in nearby Ragusa Ibla, and aside from a few key additions, like state-of-the-art latex mattresses and goose-down pillows, not much can possibly have changed since then. 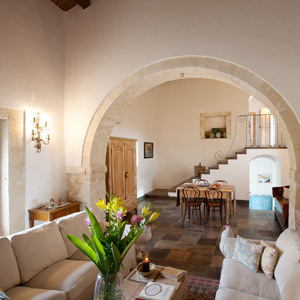 Set on a hilltop with views of the Mediterranean in the distance, guest rooms surround a citrus-filled central courtyard. 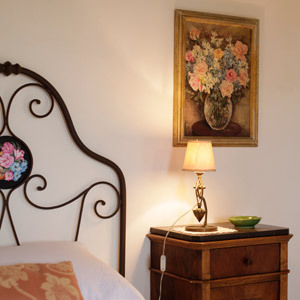 Each of them is furnished with family antiques, and the bed frames are traditional, Sicilian-style wrought iron. It’s all set amidst gardens and pastures that are more than just decorative. Fruit is picked each morning for breakfast, the cheese is made from milk from the Modica cows in the pasture, the olive oil homemade from centuries-old trees, and the herbs seasoning the food match the scent of the air outside. It’s hard to imagine things getting more local than that, and it’s nearly impossible to find fault with L’ortodisilvia, the on-site supper club wherein meals are served in the candlelit, carob-straddled garden. And starting in 2016, the rest of your body can feel as great as your stomach thanks to a comprehensive wellness suite with a Finnish sauna, a hammam, massage treatments, and yoga lessons. Please note: Tenuta Cammarana is a seasonal hotel and is closed from November until April. How to get there: Tenuta Cammarana is located approximately 108 km by car from Catania Fontanarossa Airport via A19, SS194, and SS514. Alternatively, Comiso Airport is located 35 km from the hotel via SS514 and SP60, while Ragusa Marina is 15 km away via SP36. Please contact CustomerService@TabletHotels.com to request driving directions. CANCELLATION IS POSSIBLE PRIOR 7 days to arrival. FOR LATE CANCELLATION TOTAL COST AS PENALTY. IF YOU CHOOSE NOT REFUNDABLE RATE CABCELLATION IS NOT POSSIBLE. Dining at L'Ortodislivia is available ONLY on request. Please take a look at our ADVICE BEFORE BOOKING on our website. Vista: Mar, Jardim ou Pátio.